Nick Bunker lives in Lincolnshire, England and is the author of Making Haste from Babylon (previously reviewed here). He has been a journalist for the Liverpool Echo and the Financial Times. Bunker uses his financial background and research skills to cleverly reveal underlying causes and personal details. This book won the 2015 George Washington Book Prize sponsored by Gilder Lehrman Institute of American History. This is a probing, highly readable account of Great Britain’s internal, political and financial tensions on the eve of the American Revolution. There were a number of concurrent crises in the Empire: Europe, India, Ireland and the American colonies. Each is given an assessment, with a particularly insightful analysis of the East India Trading Company. Fascinating correspondence reveals that Britain saw the colonies as mere resources/goods for their empire or a destination for convicts. They didn’t just underestimate the people, they never understood their independent nature. This book does not sum up entire aspects of the revolution, but it provides another element, an indepth analysis of important factors. It is well researched from a British perspective, which helps to provide an balanced account: rounding out and adding details, providing a clearer picture with motives and mistakes (both sides). I was surprised by number of current comparisons with e-banking and 2008 financial crisis. I enjoyed the fascinating portraits of Prime Minister Lord North, of Lord Dartmouth, King George III, General Gage and the Governor of Massachusetts Thomas Hutchinson. They might have lost the war and lost the colonies, but Britain went on to develop the industrial revolution, global exploration, and India. This would make a lovely Christmas present and gift for historian or revolutionary war aficionado. I encourage you to read this interesting history. RPL has a copy. England never had a solid plan for administering the American colonies. Benign neglect can lead to revolution. 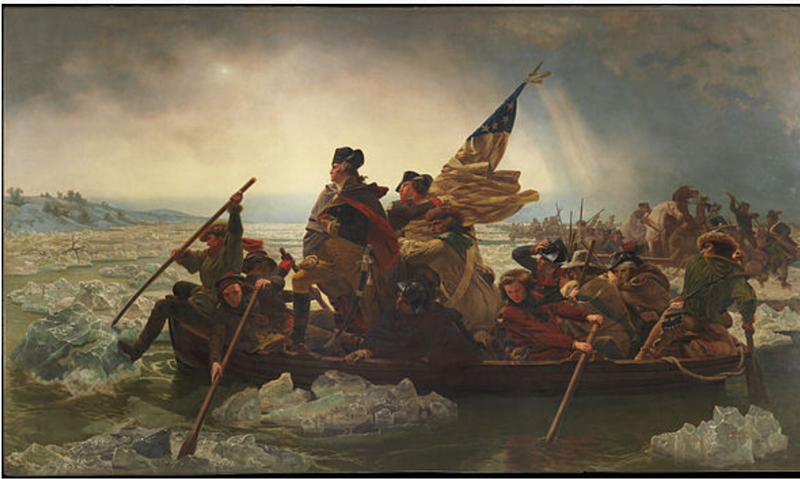 Recently, I was just lucky enough to see the new acquisition at the MMAM (Minnesota marine art museum) of George Washington Crossing the Delaware (Leutze, 1850). This painting previously hung in the West Wing, and is one of only two surviving copies. The original (1848) was destroyed by the British RAF in WWII “Britain’s final retaliation for the American Revolution”. It is a very stylized, historically inaccurate painting of the beginning of the Battle of Trenton December 25/26, 1776: the boat is the wrong model, the crossing was at night, not in daylight, the weather conditions were appalling (drizzle, rain, sleet and snow), the flag didn’t exist yet (carried by James Monroe), the river is modeled on the Rhine not the Delaware, which had a narrow crossing and sheet ice. Washington is standing, which would have rocked the boat (although higher sides would have had them all standing). With the exception of Washington, Monroe and Gen Edward Hand, the people in the boat represent the cross section of the American colonies: farmers, western riflemen, Scots, women, Native American frontiersmen, African American (believed to be Whipple, but now known not to have been there (portraits modeled from American tourists in Germany). See also NJ state quarter 1999.